Founded in 1924 the Hannington Band was formed by Mr. Leslie Wythe and Mr. George Watts Senior in order to play hymns in the village Methodist Chapel; there being no organ. Leslie was the father of the current Musical Director Tony Wythe and his sister Shelagh who is Deputy Director and Secretary. 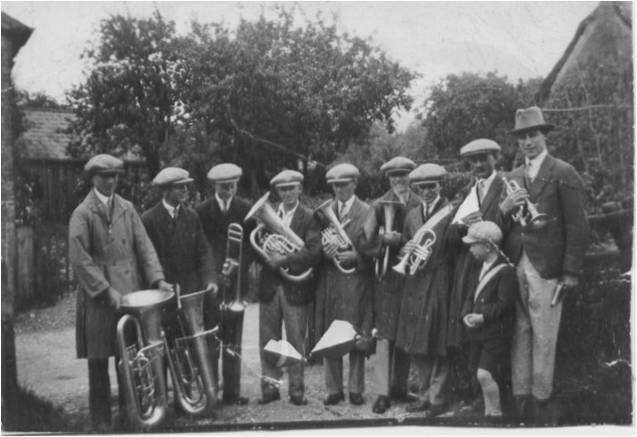 Hannington Band, like most other bands, has, over a number of years, been associated with families. The Wythe family has been closely linked with the band, at one time there were twelve members of the family in the band at the same time. Is this a record? Other local families associated with the band have been the Watts family, the Baggs family, and, in more recent times, the Baldwin family. Hannington Band has never been a contesting band, but it has supported Basingstoke Music Festival, winning the Brass Band Open Section many times, having first won the contest in 1968. The band used to rehearse in the Methodist Chapel until a few years ago when it was closed, but the band still maintains links with the Methodist Chapels throughout the area today. The Bands versatility has grown with age and it now provides music for all occasions including parks, fetes, church services, concerts, private and charity events. The repertoire is varied from classical and contemporary works to music from the shows, marches and of course hymns and other sacred music. In the past, the band has had the good fortune to be awarded Lottery and Basingstoke and Deane Youth grants. This has enabled the Band to purchase a number of new instruments with which to attract additional players, with the aim of securing its future. Tony Wythe, the musical director, joined the band at the age of seven. He admits this was a few years ago! On leaving school he successfully passed an audition to join the Band of the Grenadier Guards, rising to the post of principal cornet player, a position he held for ten years. During this time, in addition to the normal work of a Guards’ Band in London, (changing the guard at Buckingham Palace, Trooping the Colour etc.) he broadcast and recorded frequently and also toured the world with the band. On leaving he started a career as a freelance player and teacher of the trumpet. Tony also became the Conductor of many musical organisations mainly in the operatic and light musical field. He is at present the professional Musical Director of Readings’ The Sainsbury Singers. Tony has always been grateful to Hannington Band for starting him on his career in music. Band rehearsals are held at Hannington Village hall, 7:30pm and 9:30pm on a Wednesday. Please contact us if you are thinking of joining the band, we look forward to hearing from you.